I had another topic lined up today, but this (hat tip alert reader ChrisAtRU) is so remarkable — and so necessary to frame contextualize immediately — I thought I should bring it your attention, dear readers. The headline is “Toward a Marshall Plan for America,” the authors are a gaggle of CAP luminaries with Neera Tanden leading and Rey Teixeira trailing, and the “Marshall Plan” indeed includes something called a “Jobs Guarantee.” Of course, I trust Clinton operatives like Tanden, and Third Way types like Teixeira, about as far as I can throw a concert grand piano. Nevertheless, one sign of an idea whose time has come is that sleazy opportunists and has-beens try to get out in front of it to seize credit and stay relevant. So, modified rapture. In this brief post, I’m going to look at the political context that drove CAP — taking Tanden, Teixeira, and the gaggle as a proxy for CAP — to consider a Jobs Guarantee (JG), briefly describe the nature and purpose of a JG, and conclude with some thoughts on how Tanden, Teixeira would screw the JG up, like the good liberals they are. In 2012, [Lydia Holt] voted for Barack Obama because he promised her change, but she feels that change hasn’t reached her here. So last year she chose a presidential candidate unlike any she’d ever seen, the billionaire businessman who promised to help America, and people like her, win again. Many of her neighbors did, too…. [Holt] tugged 13 envelopes from a cabinet above the stove, each one labeled with a different debt: the house payment, the student loans, the vacuum cleaner she bought on credit. Kramer said she’s glad the Affordable Care Act has helped millions get insurance, but it hasn’t helped her he and her husband were stunned to find premiums over $1,000 a month. Her daughter recently moved into their house with her five children, so there’s no money to spare. They opted to pay the penalty of $2,000, and pray they don’t get sick until Trump, she hopes, keeps his promise to replace the law with something better. 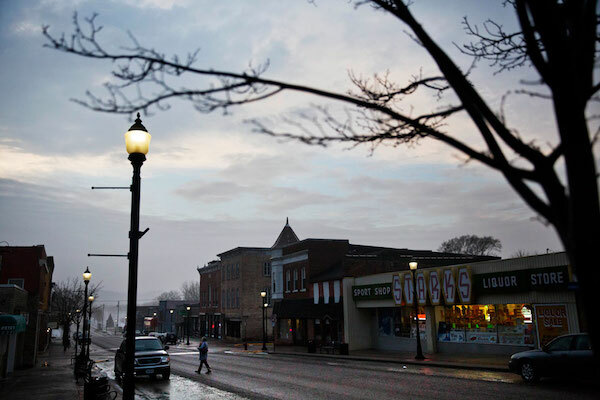 And of course jobs (as seen in this video, “Inside the Minds and Homes of Voters in Prairie du Chien, WI,” made by students at the University of Wisconsin-Milwaukee). While the election was decided by a small number of votes overall, there was a significant shift of votes in counties in critical Electoral College states, including Iowa, Michigan, Ohio, Pennsylvania, and Wisconsin. What was going on in these heavily white working-class counties that might explain support for Trump? Without diminishing the importance of cultural and racial influences, it is clear to us that lingering [sic] economic pressures among important voting blocs helped to create a larger opening for Trump’s victory. If the firm is in equilibrium, then, producing what it believes it can sell, it will hire you only on the conditions stated in the third case—to replace an existing worker. Perhaps you promise to work harder, or better, or at a lower wage. But, obviously, that just shifts the unemployment to someone else. It is the “dogs and bones” problem: if you bury 9 bones and send 10 dogs out to go bone-hunting you know at least one dog will come back “empty mouthed”. You can take that dog and teach her lots of new tricks in bone-finding, but if you bury only 9 bones, again, some unlucky dog comes back without a bone. The only solution is to provide a 10th bone. That is what the JG does: it ensures a bone for every dog that wants to hunt. There is a “residual” employer who will always provide a job to anyone who shows up ready and willing to work. It expands choice. If you want to work and exhaust the first 3 alternatives listed above, there is a 4th: the JG. It expands choice without reducing other choices. You can still try the first 3 alternatives. You can take advantage of all the safety net alternatives provided. Or you can choose to do nothing. It is up to you. If I were one of the millions of people permanently disemployed, I would welcome that additional choice. It’s certainly far more humane than any policy on offer by either party. And the JG is in the great tradition of programs the New Deal sponsored, like the CCC, the WPA, Federal Writers’ Project, and the Federal Art Project. So what’s not to like? (Here’s a list of other JGs). Like the New Deal, but not temporary! some supporters emphasize that a program with a uniform basic wage also helps to promote economic and price stability. The JG/ELR program will act as an automatic stabilizer as employment in the program grows in recession and shrinks in economic expansion, counteracting private sector employment fluctuations. The federal government budget will become more counter-cyclical because its spending on the ELR program will likewise grow in recession and fall in expansion. Furthermore, the uniform basic wage will reduce both inflationary pressure in a boom and deflationary pressure in a bust. In a boom, private employers can recruit from the program’s pool of workers, paying a mark-up over the program wage. The pool acts like a “reserve army” of the employed, dampening wage pressures as private employment grows. In recession, workers down-sized by private employers can work at the JG/ELR wage, which puts a floor to how low wages and income can fall. Enough of this crap jobs at crap wages malarky! With tis background, let’s look at how liberals would screw the JG up. Williams warns that Republican errors alone won’t give Democrats back the WWC. Or any part of the WC; as even CAP recognizes, although WWC disproportionately voted Trump, and non-WWC disproportionately stayed home. To show respect, it would really behoove liberals to deep-six the phrase “economic anxiety,” along with “economic frustrations,” “economic concerns,” “economic grievances,” and “lingering economic pressures.” All these phrases make successful class warfare a psychological condition, no doubt to be treated by a professional (who by definition is not anxious, not frustrated, has no grievances, and certainly no economic pressures, because of their hourly rate (or possibly their government contract). Really? A customer? Does the human figure have to be a customer? Why? Along the same lines, drop the “affordable” crap; ObamaCare should have ruined that branding already; what seems like it’s affordable to CAP writers in the Beltway probably isn’t affordable at all to somebody making $10 an hour. Anyhow, if something like childcare or for that matter #MedicareForAll ought to be a universal direct material benefit, then deliver it! To show respect, abandon the “Marshall Plan” framing immediately. Because it means the “winners” are going to graciously help the “losers,” right? And prudentially, liberals don’t really want to get the working class asking themselves who conducted a war against them, and why, right? Such an expanded public employment program could, for example, have a target of maintaining the employment rate for prime-age workers without a bachelor’s degree at the 2000 level of 79 percent. That ‘target” language sounds to me very much like the “dogs and bones” problem. Suppose currently we have 6 bones and 10 dogs. The “target” is 7 bones. Suppose we meet it? There are still 3 dogs without bones! Some guarantee! The JG should be simple: A job for everyone who wants one. None of this targeting or slicing and dicing demographics. The JG isn’t supposed to be an employment guarantee for macro-economists (who basically have one anyone). Second, because it would employ people to provide services that are currently needed but unaffordable, it would not compete with existing private-sector employment. This language seems a bit slippery to me. If Walmart is paying $10.00 an hour, is the JG really going to pay $9.50? Finally, you will notice that the CAP JG is shorn of any macro-economic implications. Note, for example, that replacing our current cruel system of regulating the economy by throwing people out of work isn’t mentioned. Note also that CAP also accepts the false notion that Federal taxes pay for Federal spending. That puts CAP in the austerity box, meaning that the JG might be cut back just when it is most needed, not least by working people. It’s good to see the Case-Deaton study penetrating the liberal hive mind. Took long enough. Oh, and this makes the JG a moral issue, too. The pallid language of “economic anxiety” should be reformulated to reflect this, as should the program itself. The JG originally comes from the MMT community; here is a high-level summary. Oddly, or not, there’s no footnote crediting MMTers. Interestingly, Stephanie Kelton, who hails from the University of Missouri at Kansas City’s MMT-friendly economics department, before Sanders brought her onto the staff at the Senate Budget committee, was not able to persuade Sanders of the correctness and/or political utility of MMT generally or the JG in particular. I guess those famous Democrat 2016 post mortems will never be published, eh? This will have to do for a poor substitute. Or maybe the Democrats just want us to read Shattered. Dear God. Are these people demented? Nobody who is actually under “economic pressure” would use these words. And so far as I can tell, “lingering” means permanent. This entry was posted in Guest Post, Macroeconomic policy, Politics, Social policy, Social values, The destruction of the middle class on May 17, 2017 by Lambert Strether. Yes, a great essay. And thank you commentariat. Of course, there is a potential conflict from those who want a basic income, but don’t want to work. Such a position frames such people badly, but a basic income remains an essential part of a JG world IMO. The JG would provide incentive if you didn’t lose the safety net and could add to it by working in a JG program. Most here in this place accept that a sovereign government can pay for programs which are not funded by taxes (or debt) and the JG and basic income concepts could be a way to test this in a controlled way. The main reason I think that politicians continue to have blinkers (LA LA, CAN’T HEAR YOU) with respect to MMT is that they are scared witless of a government with unlimited spending powers. That’s why we can’t have nice things. don’t want to work, hmm I don’t even know if I could work in a job without a decent amount of slack (A.D.D. mind may not be capable of it or something and often not for lack of trying, though I do a decent amount of unpaid work in my precious leisure time). Or at least not the full 40 hours, so if the job guarantee bosses are slave drivers, I don’t know, I’d probably be fired from my job guaranteed job period. But what if a job was aligned with one’s interest? Don’t know, never experienced that. But all that aside and never even mind unemployment, given how horrible the job circumstances are that I see many people caught in (and I definitely don’t mean having slack – that’s a good thing, I mean verbal ABUSE, I mean working endless hours of unpaid overtime etc. ), any alternative would seem good. This remark genuinely saddens and humbles me. For all of you doing the tough (and by tough I mean distasteful, demeaning, infuriating, debilitating) jobs: please accept my far less-than-adequate thanks. 1. Who exactly would be the employer: The federal government or the private sector? 2. If the federal government, exactly what jobs would it provide, and where in the country would it provide them? Who would create and supervise those jobs? How would JG be different from current federal employment? 3. If the private sector, how would the government find those jobs all over the country? Would JG employees take jobs from non-JG employees? 4. Why do local newspapers and online job services advertise so many jobs, if the problem JG supposedly solves is a shortage of jobs? 5. What are the criteria to be a JG employee and who would supervise those criteria? 6. What would JG employees be paid compared with non-JG employees? 7. Who would determine raises, promotions, and firings? 8. Who would handle employee complaints? I’ve asked these questions many times. Perhaps I’m at fault, but somehow I never seem to receive consistent answers. Somehow, JG seems to be a wonderful, though vague concept, floating in idea heaven, without a solid substance. Perhaps you can answer the above questions. Below my brief answers (since I am still learning) I will link to a list of articles about the JG by one of the acknowledged experts, BILL Mitchell. He has said that if you read all the articles and still have questions or concerns, bring them. He feels he addresses the typical questions and points, and also thoroughly lists the arguments of a JG being superior to a Basic Income. I have read only a couple, and he is VERY thorough. The questions you ask show that you have NOT heard or read what the experts have told us about a GOOD federal Jobs Guarantee program. You seem to have an old-style, rather clumsy structure of such a program as the idea in your head. I would recommend you look up ‘Jobs Guarantee – Pavlina Tcherneva’, ‘Jobs Guarantee – Ellis Winningham’, ‘Jobs Guarantee – Stephanie Kelton’ (many articles and youtube video presentations and interviews) to get a MUCH better foundation about the plan that is proposed so that you are not imagining something as inefficient and cumbersome as your questions indicate. 1) Federally FUNDED, locally administered. Non-profits would likely be a big part of assessing the work to be done in a community. EVERY non-profit is short of people and short of funds, for instance. 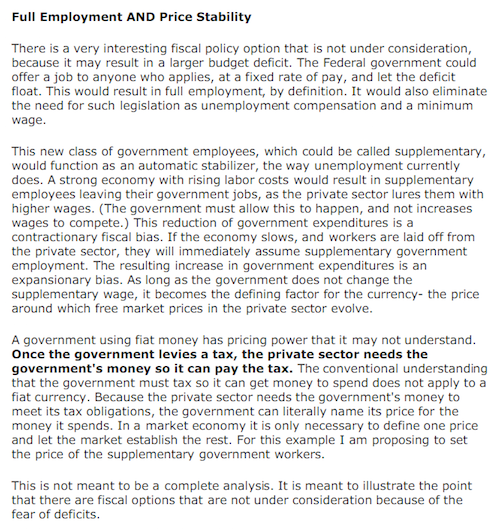 2) The federal govt will NOT be the one ‘deciding’ or providing jobs, in general. 3) Not applicable in the plan as proposed by the experts. However, since a JG would pay an actual LIVING WAGE with BENEFITS, then private-sector employers WILL have to ‘up their game’ in order to pull people out of the JG. Subsistence wages and inhumane working conditions will not be tolerated as they are now. 4) JG solves a shortage of DECENT JOBS WITH A LIVING WAGE. Most of those jobs you see advertised are FAR BELOW a living wage, and would mean that a person has to work 2-3 jobs in order to survive. 5) Fairly simple, humane criteria – want to work, be able to provide some useful service, and the COMMUNITY can decide what it would like to be done. EVERY community right now has a LOT that is not done but is needed, because most such work is NOT ‘profit-generating’. The JG will mean that such work has value even if there is not ‘profit’. It is BEYOND TIME we measure things by taking into account factors besides dollars generated. 6) JG pays a LIVING WAGE with benefits. In other words, it is humane and gives people dignity and the ability to live with some security that they can afford a roof over their head, and afford to eat, and are contributing and are VALUED. Strange concepts for this country, but many others have provided this security and dignity for DECADES. 7) and 8) Again, you are thinking of a completely different paradigm than what the experts propose for a JG. However, if someone does NOT do what they agreed to do, they either find another JG job or do not get to stay in the JG program. Also, besides this list of about TEN articles by Bill Mitchell, I would highly recommend you see the movie ‘Where to Invade Next’ or AT LEAST look up some of the clips on youtube about what other countries have had for DECADES to give people lives of security and dignity and well-being. That is why THEY score far higher on ‘quality of life’ than people in the US have scored for a long time. It is shocking to realize how far ahead they are and how HUMANE they have been in creating policies for PEOPLE, not based only on profits and greed. I knew they were better than we are, but had no idea HOW MUCH BETTER. The “target” language also makes me worry that they’re defining optimal employment by the inflation-obsessed standards of Chicago-school economists, thus coming up short in the name of protecting the investor class. Minor quibble: Does Maine constitute flyover country? Usually that term means the parts of the country that the well-to-do “fly over” from east coast cities to west coast ones, with perhaps an exception for Chicago. You wouldn’t fly over Maine for any of those routes. Not to mention, Maine is a popular vacationing/summer home state for rich New Englanders, so it doesn’t exactly have an “other” status for them the way rural Wisconsin would. I think Maine is legit flyover country as flying over Maine was once mandatory on the transatlantic route in order to Gander Airport in Newfoundland. I know, I know, it’s a bit of a stretch but I’m trying here! As for Maine’s other status, you’re spot on about “down east” (coastal) Maine and some of the lakes being popular with the landed gentry, but the interior of the state is sparsely populated, poor, white, and marginalized. Many of the paper mills have gone belly-up and the economy in many places consists of picking potatoes or cutting down trees. I used to do a lot of business travel to Nova Scotia. Hard to get there from the US without flying over Maine. But I think Lambert meant flyover in the pejorative “why would you live here when you could be an artisanal pickle maker in Brooklyn” sense. Maine, IMNSHO, is both literally and figuratively a flyover state. Figuratively because we suffer the ills of de-industrialization, including an opioid crisis. Literally because Maine is a big state, and there’s a lot of forested area (what’s called “waste” land in White Trash). People (speculating) who fly over Maine in their private jets think, therefore, that Maine is empty so its OK to situate landfills there. Thanks much! A JG as you describe plus nationalizing all our current rentier industries ought to just about do the trick. Matt Bruenig had other issues with the article: More Job Guarantee Muddle. While he points out that the jobs suggested in the article should be permanent rather than temporary jobs, I go on with my own little sense of discomfort that they all involve putting the otherwise jobless in charge of caring for the helpless. I don’t find that a good idea. I’ve spent enough time both working with and volunteering in human service organizations to have observed that it’s not really appropriate work for a lot of people, even for many good-hearted volunteers. It really dampens my enthusiasm for a JG that I have yet to see an argument for it that doesn’t invoke child and elderly care as just great jobs that the jobless can be put to doing. Fair enough. That said, the concept of the JG as a counter-cyclical buffer against unemployment is, AFAIK, unique to MMT and a key aspect of the program. The basic premises is to replace the ev’bal NAIRU with a JG and tax policy taking care of the rest all administered by social democratic institution – local or regional preferred. But what better way to put people off by talking about rubbish pick, changing adult nappies or boring chores. May I suggest that universal health care would be a good place to start, infrastructure, all the environmental dramas such as lead pipes et al. Conversely we can sub it out to the looters with high admin costs and profit expectations which ultimately get used to leverage governments to rinse and repeat the whole process again…. self licking ice cream cone thingy…. Finland used to have JG and it was used to build roads and other infrastructure. Although, that too requires you to be not useless. Thanks for this article Lambert. Why should we trust CAP to handle this when they have done nothing toward this end in their entire history. In fact, in undeniable fact, if we don’t do something about demand in this country we will have no economy left at all. For these guys to even approach a JG you know they are panicked. Nobody goes over this fact because it turns them all into instant hypocrites. I spent yesterday listening to some MMTers on U-Tube, Wray and some others. They all clearly and succinctly explain the systemic reasons for JG. Not nonsense. In fact, MMT approaches a JG as the opposite of nonsense on so many levels. As you have pointed out – these CAP people are a little late to reality. And their dear leader Obama is first in line for the blame, followed closely by Bill Clinton and his balance-the-budget cabal of bankster idiots. And etc. And these JG jobs could be just the jobs we need to turn global warming around. It could be the best spent money ever. It is a very straight-forward calculation. That said, LeCarré’s George Smiley says somewhere that he’s “not looking for perfection, but advantage.” I think that’s a good attitude to adopt, generally. The low wages and low employment rates for those without college degrees only exist because of a failure of imagination. More and more I’m inclined to a kind of Trotskyist contempt towards this stuff. Marx, Kalecki and boatloads of others would say that this pretends that an ideological limitation is purely arbitrary with respect to social context and that all we need are bright people and minds open to what appears to be wholesome labor market wonkery. In other words, if you want an example of the dishonest hopefulness of rank idealism, here ya go. As soon as CAP runs into the implacable realism of capital’s demand that labor costs be minimized their imagination will wither and their cheery hustle will be dropped in favor of some other distracting gesture. The only thing + about the CAP piece is that it shows us that corporate Dems realize that they have to at least pretend to be substantive about addressing the problems in the labor market that they themselves encouraged with globalization. I don’t know how you even bother. America is so far away from this intellectually and culturally, there is no chance. Right now the “jobs guarantee” is get arrested for something bogus and be sentenced to prison to do forced labor for outsourcing corporations (yes this is real). Look where the GOP stands on basic issues which were settled long ago in Europe, they are in the Stone age. The Dems are right wing everywhere else. With US institutions usually run horribly how do you expect this to be well run? Is the VA a shining example? I certainly would not have hope for this at the federal level. I feel the same way often but I’ve got to allow myself some hope once in a while. This development is at least turn in the right direction for the moment, nothing else. There’s nothing wrong with being (aprehensively) pleased about that. I’d like to get a basic unemployment welfare scheme going first. We don’t even have that! We have an “insurance” program which requires you to first have held a job which paid enough for long enough, and then get fired, not quit. And it only pays for six months. Again, this was settled in other rich countries a long time ago. Swing for the fences, ladies or gentlemen. Throw incremental change overboard, along with Hillary, Tim Kaine and Neera. There is a job guarantee in Castro’s Cuba. So wonderful, people are swimming from Miami to Havana ever day. Though you have it exactly right in the US … the job guarantee is to be a felon on a privatized prison farm … usually called a “plantation”. I am looking forward to my neighbors finally being put to work. At least it is only building a Presidential Library for Obama, not a pyramid for Pharaoh. That is why Cuba will never last! It will die in minutes, without any outside help! Mind you, here’s a thought. Maybe the one’s who didn’t want to work, left for Florida! My prediction: by the time this makes it through Congress, it will be a guarantee for no more than 15 hours per week at slightly below the minimum wage and you’ll only be able to be in the program for nine months, total…during your lifetime. Or am I being overly cynical? Even though I’m cynical, I’m with Lambert in being for just about anything that makes us bottom-20%ers lives better, even if it is highly flawed. Heck, I’d even be for a BIG on that basis, even if Yves is right about the negative side-effects of that policy. This is EXACTLY what Bismark did in 1883 with his Staatssozialismus (state socialism) reforms. In 1883, Germany still had hope … it was only 12 years old! If I understood correctly, Norway is running such a program since many years. Basically, when you are out of a job, you get unemployment benefits (a low but decent salary, health care and other modern facilities unheard of is the US) – which last forever. On the other hand, any public institution can call you in to help a hand: washing dishes at the school kitchen one day, waiting on the elderly the other day, helping out in the local library… wherever hands are needed but not available. So it is not really a JG, but you are guaranteed to help out your local community, and you are guaranteed a minimal income. That seems close enough to me. This is just positioning to defend against a challenger from the left who is promoting a genuine JG. See we agree about a JG, I’m for it too and here is my 9 point proposal on my website. Thanks, Lambert, for a very interesting post. I combed through CAP’s panel of “experts.” I was not impressed. I’m going to start my own think tank. Gonna call it CRAP: Center for Real American Progress. Of course in the north in the winter you could go back to shoveling snow with snow shovels (no machines allowed) and ban use by public employees of riding lawnmowers in the summer in favor of powered walk behind mowers. From what I have read this is what china did on the 3 gorges dam, partly making the project a jobs project by doing things in a human intensive way. (of course you could go back to the hand push non powered reel mower but then you have to worry about folks and heart attacks. (Or use those in their 20s for this. Growing up in MI and In this is how we mowed the yard. (in the 1950s and 1960) and for snow shoveling, my dad got a snow blower when I went off to college. I’m partial to John Cleese Silly Walks. It would be creative and artistic. We need more art. This is a restatement of the classic riposte that JG jobs will be crapified. If the politics are done right, they won’t be. If we end up with a neoliberal infestation, they will be. I haven’t been able to reconcile in my own mind the contradiction between a government “supplementary job” that should be kept less than private sector employment and a non-crapified job. A job where a worker can “immediately assume . . . employment” (quotations are from the Mosler email quoted above) rules out anything that needs knowledge specific to the project or need for long-term commitment to carry a project through to completion. The WPA wouldn’t command our fondness if the artists had left their post office murals half completed when private sector jobs opened up. I like the set rate of pay. It saves lots of administrative overhead in determining what the rate of pay for any specific job should be. It does, however, raise challenges. A good rate of pay for a person whose private sector job is likely to be laborer would not be considered good for a person whose private sector job is likely to be insurance actuary. And if the goal is to get the person employed in the private sector again, then the pay must be high enough to allow the person to take time to go job hunting. And we’re back to how to keep the pay low enough not to compete with the private sector. And again, on the side point, Michael Harrington’s idea was that anyone could walk into any post office and get a job at I believe it was $10/hour (the minimum wage was something like $3.50). He of course was interested in raising wages, especially for the lowest paid. It was before the sentimentality about job quality and work fulfillment had advanced to its current level. The structure of the proposal seems to me similar to Mosley’s, but I guess it isn’t an economic stabilizer unless you announce that it’s an economic stabilizer at which point it becomes your own original idea. Sorry to be so long winded. I’m basically just saying that concern about what proposals mean for human beings in our society is valid. An MMT JG will be great! It’ll be so great that you’ll get tired of its greatness!!! Well, maybe, but I think you’re giving short shrift to valid concerns when you dismiss reservations about the real quality of the jobs a JG will offer as promoting neoliberal crapifying. I have a teensy-weensy little bit of sympathy for your assertions. What you — along with so many others — have picked up on is the prevailing narrative, which is all about us in the air, that is in essence “guberment caint do nothin’ right”. So a government-managed Jobs Guarantee program is Bound To Fail. Is is incompetence by proxy. Which is, of course, a guilt by association logical fallacy. As always with these pieces of perceived and self-reinforced folk wisdom, it maybe helps to step back and ask yourself — where did my thinking come from? Who gave me this “information”? What, if anything, did they have to gain from selling me it it? It sounds like the CAP JG proposal is “top down” in that the “palette” of jobs to be funded is decided by the same agency (or an agency at the same level of government) as the fund disbursement authority, or is specified in the law itself. It that right, Lambert? Is “top down” another way that centrists could screw up a JG? And might the “local devolution” aspect of the NEP/MMT Primer concept appeal to folks on the right? > It that right, Lambert? Is “top down” another way that centrists could screw up a JG? And might the “local devolution” aspect of the NEP/MMT Primer concept appeal to folks on the right? … [D]on’t turn it into an ObamaCare-like Rube Goldberg device of means-testing, worthiness detection, gatekeeping, and various complex forms of insult and degradation, like narrow networks. “Top down” in class terms (i.e., designed for the 10%) as well as organizational terms (the party and that portion of the State the 10% controls). Great write up. I obviously have a long-running disagreement on the policy prescription of JG, but I do find it interesting talking about how groups like CAP present it outside the specific confines of MMT (and, apparently, without even tipping the hat to them…?). One concrete bit of info I would love to know is how they estimate 4.4 million workers for take-up. First, it’s a hilarious instance of false precision. Second, it’s remarkably low. $15/hr is approximately the median wage. Tens of millions of workers would sign up, both from the ranks of the crap jobs and from the ranks of those out of the labor force. I’m picturing a liberal JG launch like the ObamaCare website launch. “Too many” people apply, the site crashes, the solution to the debacle is some sort of lottery or wait list. Anything to create winners and losers! Oh, and there will have to be “navigators” to manage the complexity! I hope you will all read the JG article by Matt Bruenig linked to above, and which would make a good subject for another post on NC in its own right rather than only discussing it here. Some kind of program like this is an inevitability because the political consequences of 1930s style unemployment, technologically created, are unacceptable to TPTB. Just as inevitable is the Obamacare style crapification of the program. What weird kafkaesque, humiliating, workhouse type kinks will they be able to outfit it with? We await lambert’s coverage there of. There are plenty of jobs out there now. Real problem: they don’t pay as much as a truly free — YOU KNOW, HIGH UNION DENSITY — labor market would pay. My (cab driver) point of view: if fast food with 33% labor costs can keep enough customers to survive (might get more — min pay recirculating demand to lower pay firms) at $15/hr, then Target at 10-15% labor costs should BE ABLE TO PAY $20/hr, and Walmart with 7% labor costs could plausibly pay $25/hr. Top Clinton economic adviser Jason Furman once said that Walmart saves poor consumers $260 billion a year in lower prices. Cut 10% from that and Walmart could give every one of it’s 1.2 million employees a $20,000/yr raise. More!!!!!!!!!!!! : fed min wage is $4 below what it was when per capita income was half today’s (1968!). but, the bottom 20-25% are worse off absolutely than when average income was half today’s. Let me repeat that (hopefully psychologically catching): the bottom 20-25% are worse off absolutely than when average income was half today’s. So why don’t we stop playing around with guaranteed jobs and guaranteed income and start rebuilding US labor market density which is down to 6% in private economy (not much different from 1%) Stop talking about manufacturing and make Walgreen’s jobs (great place to work other than pay) pay $20/hr? Simply make union busting a felony, starting at progressive state by progressive state level. (For those of you only concerned about the Dem party, not really people) Republicans will have no place to hide. (For those who that’s all-you-really-care-about — even if you don’t know that) Republicans will have no place to hide. I would suggest that you compare & contrast the difference between CAP & CPER (Center for Economic Policy Research). Dean Baker has a good plan for taking on medical patents, that would lower Medicare & Medicaid costs. Personally, I think a look at CPER economists would a good thing. It’s the difference between the priority of getting getting votes & actually doing something for the middle class. I’m not suggesting an “assignment” but would truly appreciate your input. Both have their stable of economists working within the system that exists. I appreciate your posts on MMT but short of adopting it, I’m leaning CPER. Testing this. I like the idea of GJ but fear it will not get support if A. It doesn’t help the educated class, and B. If white people perceive it as taking part of “my” income to subsidize darker skinned people to have what will be laughed at as make-work jobs (even if they’re not).